To say I was excited was an understatement but it was marred by me feeling really sick on the day. So sick that usually I would have but cancelled by there was NO WAY that I was going to miss getting my braces off. I drugged up on some health food store supplements and soldiered on. It was a fairly lengthy appointment though – almost 2 hours so I left my son at home. Thankfully, I just rested in the chair the whole time, it was all pretty easy. Unfortunately as I wasn’t well, my memory of the whole process is a little vague so hopefully I’m getting things in the correct order. It was really cute to see that they had blown up these balloons and stuck them to the chair to celebrate the occasion of getting my braces off. I felt like we were all excited together. Melanie explained that usually, they leave everything intact and “glue” (there’s likely a far more dental like term) the fine silver wire in behind your front teeth. 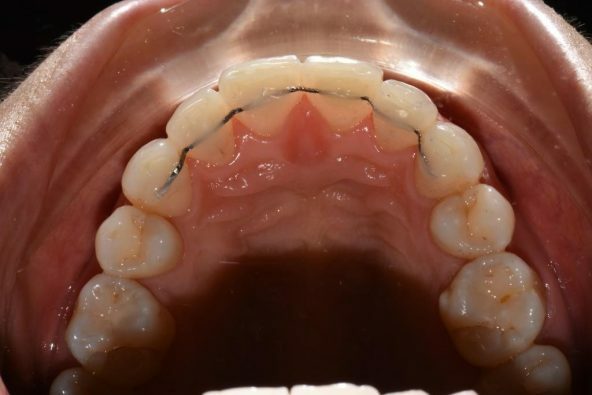 The idea is to ensure your teeth don’t move at all and the wire is able to be inserted into the exact right spot. However, as I had mentioned I was still a little disappointed about that tiny overlapping tooth (which was seriously very minor). Melanie suggested that she would place gentle pressure on the tooth to move it into place while glueing the wire. She warned me that it may not work but that as the teeth are more flexible during orthodontic treatment it was worth a try as the overlap was so minimal. She removed the bands, powerchain and wire and it was a little tricky for her and Lainey her dental assistant to fix the silver wire and manoeuvre the front tooth into the right spot at the same time. I felt pressure but no pain. To set the glue, I could see a little light being placed in my mouth and I assume it’s kind of like the light that sets the gel when you get your nails done as it had the same glow. When everything was done, I was given a mirror and my smile was as wide as anything. The overlap was gone – hooray!! If I could have pinned a world’s best dentist badge onto Melanie’s coat – I would have! Then the wire was glued behind my lower teeth and the bands and wire removed. Then came removal of the actual brackets. I had been extremely lucky or as I like to tell Janine at reception – a gold star patient . 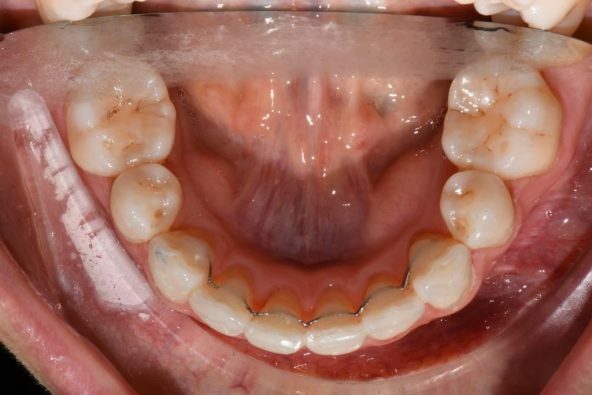 I didn’t have any issues with brackets during my treatment time so I never experienced a bracket coming off or having to have it replaced. I am a bit of a stickler for rules though so stayed away from the foods to avoid list I was warned about. I hadn’t really given much thought to how the brackets would be removed and when Melanie pulled out a plier looking tool, I was a little apprehensive. She calmly explained that they just loosen the brackets and they pop off easily. Turns out it wasn’t painful at all. Melanie then explained she needed to remove the cement (again probably not the dental term) from my teeth that had been holding the brackets and also the little mountains that she had built up on my back teeth to stop my jaw from crunching down on the braces and biting them off. It basically felt like it does when you are getting your teeth cleaned except they stayed away from the gums. I pretty much just dozed off during this time as there wasn’t much for me to do and the machine was fairly noisy so I couldn’t really hear what was going on. When that was all done – I got to take a look and run my tongue across my teeth. It was amazing. My teeth looked better than I could ever have imagined. They were so white! They had to take more moulds of my teeth so that the removeable retainers could be made. As part of the QST process, you are given retainers that you need to wear at night. I am not bothered by this at all and actually feel comforted as I don’t want anything messing up my new dazzling smile. The retainers will take another 3 weeks to make so I booked another appointment for a few weeks time. Hilariously, and also disappointingly, many people didn’t even notice that I had my braces off. Even when I smiled really widely and obviously they just said “what?” self-consciously and waited for me to tell them some exciting news instead of that I had my braces off. Their explanation was that they really didn’t notice the braces that much which was a really good thing but it did make me feel a bit sad at the end. I can’t have it both ways though and if I had to choose I would so totally choose to have invisible braces during the process and no one realise I’ve had them off. I am absolutely loving my smile and my straight teeth. Even though my entire treatment took 7 months, I know that in reality, that time could have been shortened as I did muck around with some appointments. 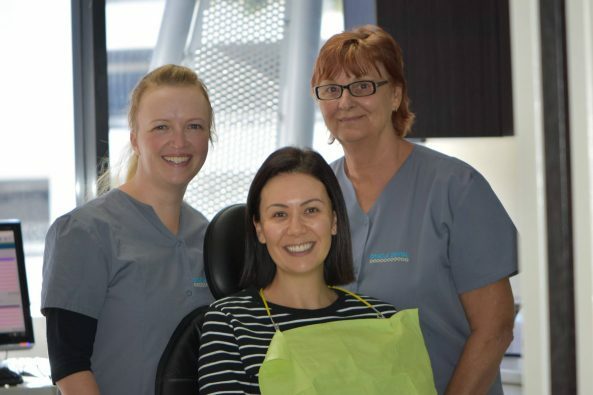 I feel very confident recommending Oracle Dental and the entire QST process – in fact, one of my favourite friends is around halfway through her treatment with Melanie and her team and her results are nothing short of amazing. I am in shock every time I see her and whenever I see the pictures of her, the whole QST process is almost too good to be true.